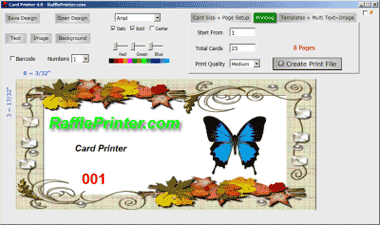 Click Start Card Printer to download and start the program. Card Size + Page Setup tab. You can fine tune to exact sizes by increasing or decreasing the page horizontal and vertical margins. The Page Layout graphic will show page layout and margins as you change them. Mouse over the Page Layout graphic for details of item size and ↔ ↕ Margin dimensions. You can adjust margins to get exact dimensions to fit pre-perforated paper. 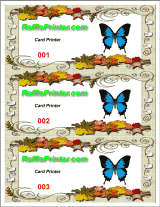 Design Cards, Invitations, etc and create and save a Print File. Open this Print File and print pages in batches, or send the print file to a Printing Company for Printing. See Printing for more Printing help. Open this Demo Print File to see the format. Once printed, cut the horizontal and vertical lines on the cut marks. You will need a reasonably fast printer to print lots of items. Try printing a demo page to get an idea of the total time it will take to print all pages on your printer. Keep images and backgrounds to a minimum to speed printing and conserve ink. 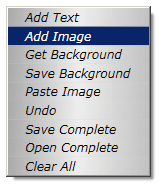 To add images, right click the designer, choose Add Image and select an image from your computer. Or right click an image on a web page (that you have permission to use), choose Copy then right click in the designer to position and select Paste image. You can drag, flip, mirror and rotate images by right clicking and selecting from the Menu. Roll the Mouse-wheel to re-size. Add Individual Names and (matching) Individual Images to printed items. Select 'Multi Image Demo' and then 'Fortune Cookie Quotes' from the Pre-Sets drop-down and mouse over the Name Count label to cycle through images and quotes (names) to see how it works. Add QR Codes Scan QR Code with phone to browse to a page or site with details relevant to your organization, event etc.